Screenprint on archival paper, Edition number 84/100. In Aboriginal mythology, the Wandjina are cloud and rain spirits. Lines or blocks of colour around the head of the Wandjina depict lightning, clouds or rain. Wandjina figures are found in the caves of the Kimberley region, Western Australia. Lily (Mindindil) KARADADA was born in the Prince Regent River area of Western Australia in 1921. From her father's country, Woombangowangoorr, she went with her mother and family to Mitchell Plateau. She married Jack Karadada and eventually settled in Kalumburu, where she still lives with her huge extended and very talented family. Lily is one of Australia's most important living Aboriginal artists and her paintings are instantly recognisable. 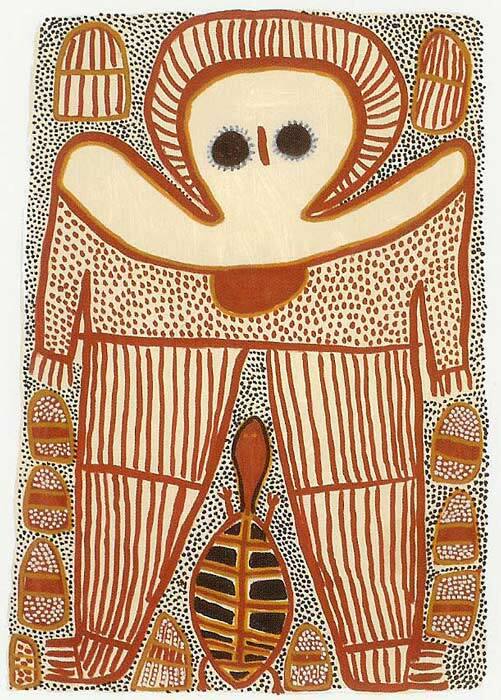 Lily paints Wandjina with varied totems, rain dotting, lightning (Black Wandjina), turtles, cave pools with bubbles. In 2003 Lily was awarded the Australian Centenary Medal for her contribution to art. Copyright © 2015 Aboriginal Dreamings Gallery. All Rights Reserved.